So excited to share my latest creation and to get back to blogging! The last couple of months have been very busy but things are getting back to their 'normal' pace (whatever that is..hahahaha). I've name this my 'Hiatus' dress as it allowed me to jump into sewing after a brief break! I was so eager to get back into sewing after this busy time that I happily started this dress on Saturday evening and finished it Sunday morning in order to make the Sew Weekly Reunion deadline. 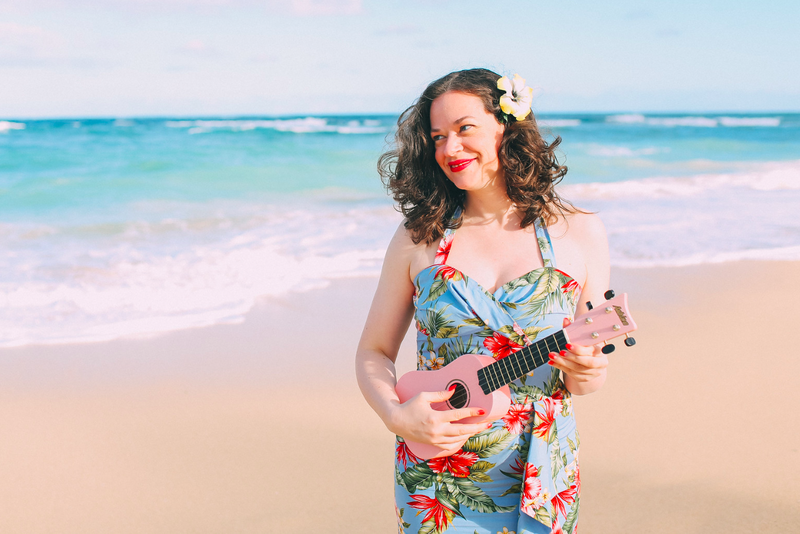 A super big thank you to David for guest posting during the hiatus and to the lovely Sew Weekly ladies for letting me sneak my post in last among all the amazing creations! I opted to make version 'A' with the long sleeves and without the front pockets. The colour of the dress is difficult to photograph depending on the light but is a lovely deep purple or 'acai' colour. I had the viscose in my stash and found it was the perfect match for the Sew Weekly Reunion challenge theme of sewing with the Autumn 'patone' colours. I graded the pattern down by four inches, which despite the unusual bodice shape was not too difficult. The bodice consists of two side pieces that are gathered and sewed by a lapped seam under the main bodice piece. The bodice also extends into a 'v' point at the centre front and then is also attached to the waist by a lapped seam. The skirt front forms a pleat right under the 'v' point. I've left it as a soft pleat instead of ironing the pleat folds. The dress closes with a side zipper and back neck button. I made the long sleeves which have gathers at the elbow. The sleeves are attached with gathering on the sleeve cap as well and I also inserted some extra material to help stiffen the sleeve caps. I made a matching belt with a lovely vintage purple belt buckle that I was generously gifted in a previous Sew Weekly swap. I really love the dress--and believe it or not, it's already cool enough to wear long sleeves. 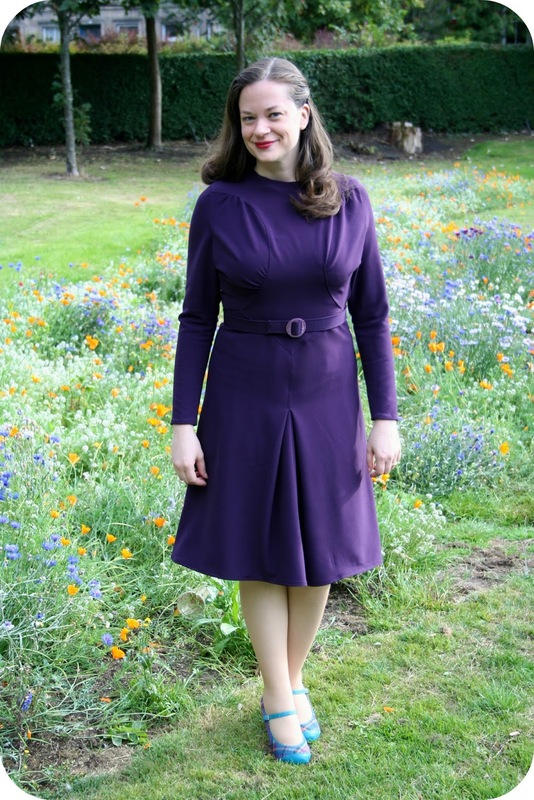 Purple is such a great colour and the design of the dress is perfect for the viscose fabric! I anticipate getting a lot of wear out this McCall make. Love that dress, the color and the pattern certainly suit you. So nice to have you back blogging! Lovely dress! And you are a fast sewer! Lovely dress! You lookk great in it and all greenary around! Beautiful dress Debi and the colour is lovely on you. What a lovely dress and that color looks smashing on you! The perfect fall/winter dress! What a fantastic and unusual shape! So 1940!! Perfect with your awesome tartan shoes too! Lovely to see you in a McCall's 1940 dress once again! yay! 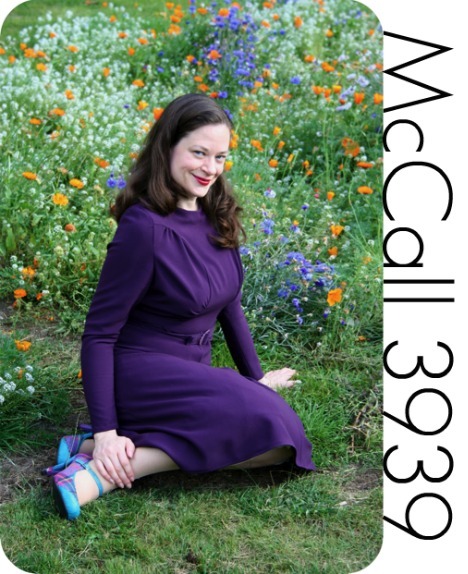 Purple is gorgeous on you! This dress turned out beautifully. Glad to hear that you are finding rhythm in your daily routines, and it's always fun to see the projects you've been working on. That is a gorgeous dress and the colour is fabulous on you! And your shoes?! I adore them! It's so nice to see you blogging again - you have been missed! This is really lovely. What a fabulous style and colour. What a cute dress! Love the style. Well done! Fantastic dress, Love the colour and the waist detail. Great to have you back blogging I do enjoy your posts. It's great to see you're back to sewing and blogging! Thanks so much Lauriana!! 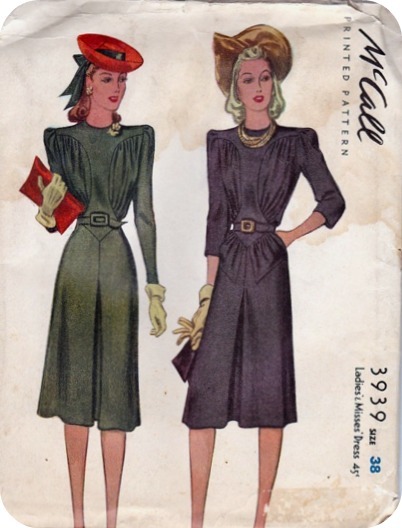 I can't wait to see more 1940s fashion inspiration from your magazines!! Thanks so much Keren! I also really love the waist detail on this dress--it's so unusual! Thank you m'dear!!! I do love the futuristic look of some of the 1940 patterns...some are so completely unique that I haven't seen anything like them since! Thanks Sarah! I loooovvveee the shoes (from my favourite store called Ness: www.ness.co.uk)--so happy they go with the dress!! Purple has always been one of my favourite colours! thank you so much!! Thanks Gail!! 1940 had the best silhouettes and shapes!! Thanks Tanya! Yes--I must say that I really love sewing for fall/winter!! Thank you so much! Such a lovely comment! Thank you Sarah! I just love it! Thanks Doris!!! Aren't the shoes fabulous? They are from my absolute favourite Scottish company called Ness (www.ness.co.uk). They are still selling these heels in the red tartan (which I also have..hahahha). It's under 'accessories' on their website. Plus, I imagine their new line will be coming out soon too and I'm hoping there are some new shoes!! Thank you so much! I was really happy we caught some late flowers in the park!! Thank you so much Siri! It's great to be back! Awwww...thank you so much! I do love the 40's!! What a unique dress! This looks great on you! Thanks, Roisin. I really appreciate that, and all the support I've had whilst covering for Debi during her busy time. I'm really glad Debi is able to sew again, and this dress is definitely high on my list of favourites that she's created. What an absolutely lovely dress. Vintagey but with a modern freshness! So envious of your sewing skills. Look forward to your future creations.. Love the gathers around the shoulders and the inverted pleat. Oh Debi I'm so happy to see you blogging again! This dress looks great (what interesting details, too), and what a lovely one to sew up after a little break. So glad to see your smiling face! Thanks, Roisin. I appreciate that. I am really glad Debi has been able to get back to her favourite hobby. She's been sewing all weekend - it's been great to hear the hum of the machine again.